Front entrance of Hospital Frank S. Beck. Standing with us are the physican, director, and Beck family friends. Quote from Bessie and Frank's letter written in 1964: "This small village is located on the eastern shores of Lake Titicaca, at an altitude of over 13,000 feet. Here the climate is always cold, especially when not in the sun, so that we sit by the kitchen stove in the evenings and heat stones to warm our bed at night. There is a small consulting room and pharmacy here, together with a mobile medical unit, which Frank has recently put into operation, making regular visits to different villages along the Lake. He also is giving physical examinations to the thousand students in seventeen rural schools in this area. He takes X-rays, does minor operations, delivers babies, extracts teeth, and takes care of all kinds of medical cases." "Recently a truck overturned along the shores of the Lake, throwing all of the passengers and their bundles into the water. Four were killed, and twenty-two injured, all of whom were brought to our medical center for treatment. At first they were cared for in our kitchen and living room, where their wet clothing was removed and dried by the fire. In turn they were transferred to the consulting room to have stitches taken, bones set, and wounds treated. The most serious ones were put into our five patients’ beds, while the others were taken by the Mission truck to their homes, where they were later visited for further treatment and observation. Since that time, the Mission Medical committee has approved the request for a gift of $12,000 to build and equip an operating room and additional rooms for patients, so that we can better take care of the medical needs in this area." 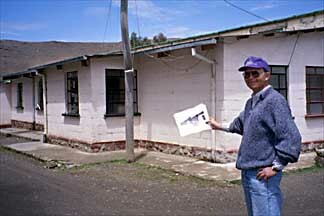 "When we left Bolivia eight years ago, there was but one medical center, with a doctor, in Bolivia. Now there are four, and more are requested. Many new schools and churches have been opened. 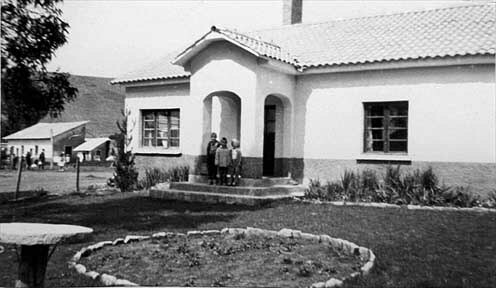 In Ancoraimes, there is a new Girls’ Boarding School and a Vocational School of three years, where Bessie is teaching Psychology and Sociology. In La Paz, recently there was the dedication of an addition to the Nursing School connected with Pfeiffer Memorial Hospital, and a new Secondary Building for the American Institute. 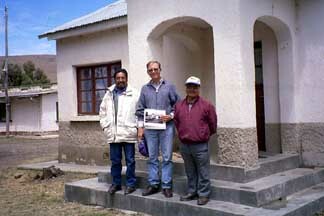 In Santa Cruz, two new churches and pastors’ residences have been purchased, while new work is being opened in Tarija. 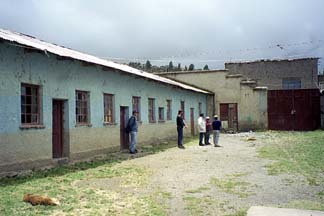 In Montero, north of Santa Cruz, an entirely new center of work has been opened, with a good church and Seminary, a Secondary school, an Industrial Arts building, and 15 teaching centers in surrounding colonies. It has been an inspiration to see the progress along all lines." Entrance to clinc. Inside the room there were 4 treatment rooms. Through the second red door is the location of the first medical clinic in Ancoraimes, befor they built the current clinic. 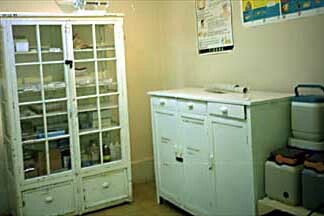 Frank used one of these small rooms as a clinic to treat patients during his visits from La Paz. 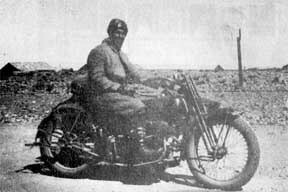 He traveled with Nestor Perenanda, who was a Methodist pastor who would translate Amaryan to Spanish for Doc when they would visit the Altiplano on my grandfather's motorcycle. 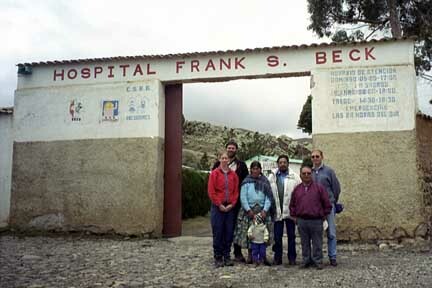 Doctor's residency at Frank S. Beck Medical Clinic in Ancoraimes, Bolivia. 1957. When I showed the picture from 1957 to Nat Robison, after studying it he realized, he was the child in the middle. Nat is standing in the middle again, holding a copy of the original that we gave the clinic. Nat's father and mother were Methodist Missionaries after Dr. & Mrs. Beck had retired back in the States. 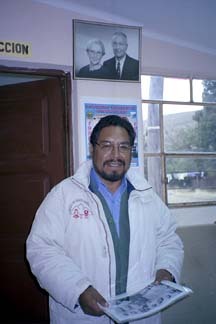 Nat stayed in Bolivia and is the director of Andean Rural Health Care. Doctor offices, treatment rooms, and patient rooms are in the above clinic. 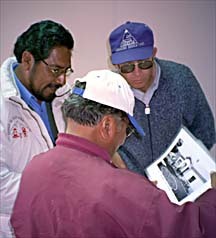 Nat is holding a copy of this photo from 1965. The clinic is very tidy, clean, and organized. It is equipped with a dentist chair, birthing room with ultrasound machine, and oxygen tent over a crib. When I saw the ultrasound machine in the birthing room, I explained how Dad invented it in 1956 by placing his arm on the machine while testing fuel rods. The staff was impressed. 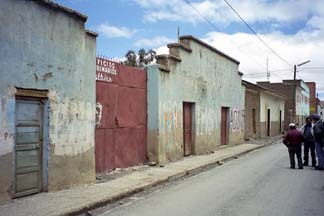 Ancoraimes is about a 3-hour car ride from La Paz on the shores of Lake Titicaca. It is one of many small towns on the lake and has a major temporary river watershed for the snowmelt coming off the mountains and traveling to Lake Titicaca. Doc planted a row of 20 eucalyptus trees on the edge of the clinic grounds in 1960 to prevent the river from washing away the buildings. There is a large white sign over the gated entrance that says, "Frank S. Beck Hospital." Quote from Bessie and Frank's letter written in 1964: "When school opened, Aymara children were present in droves. School had no sooner begun than the town's mayor appeared, trailing a cordon of police. Beck was thrown into jail, spent the night fuming in his cell. In court the next day, he indignantly addressed the magistrate. "They say I have no right to start a school here, or vaccinate your children against smallpox. What in humanity's name . The judge smiled and lifted a hand. "You don't remember me, Dr. Beck? I studied under you at the American Institute!" He called the authorities to the bench, made them apologize. Then, turning to Beck, he said: "Please teach us better manners toward our benefactors. ""Today (1959), as a result of Beck's help, there are 18 Methodist schools on Titicaca's shores, plus a small clinic and a four-room cottage for the doctor. The schools and clinic serve 26,000 Indians, who come from 35 miles around. The settlement is named "Beck Memorial." Becks left Ancoraimes in mid-1964 when Dr. Beck was 76. "They returned in 1966 to visit mission medical work and went to the hospital he had planned in Ancoraimes which was now finished and named after him. It had twelve patient rooms and a small operating room. 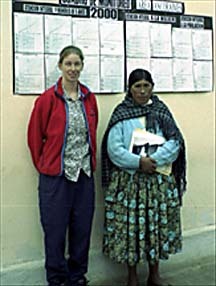 Public health care program known today as Andean Rural Health Care (ARHC) in the United States and Consejo de Salud Rural Andino (CSRA) in Bolivia. ARHC takes workers into every home in every village at least twice a year. Using this strategy they have reached an immunization rate of over 90% and have reduced the risk of death for children under five to one half of that in other areas of Bolivia. 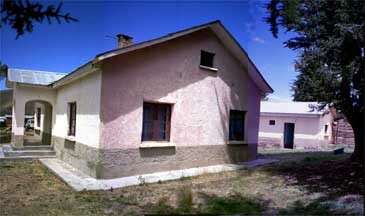 The clinic serves an area of about 20 kilometers (12.5 miles). Families who live within a day's walking distance will be treated in the clinic; others will receive a visit from a nurse. The goal is to visit each remote home twice a year, over 14,000 people in 52 communities. I was happy with everything that I saw, and I would encourage others to visit and support these clinics. 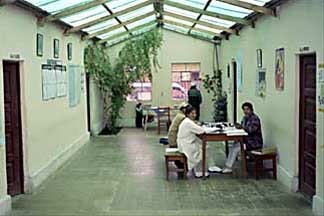 In February 1992, the Bolivian Methodist Church formally requested ARHC/CSRA to provide financial, administrative and management leadership in the provision of health care for the 51 villages in the Ancoraimes area. There is one new building that is storing 30 new mountain bicycles donated by the British government. 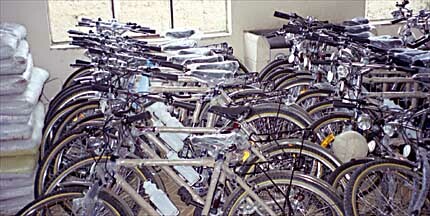 The mountain bicycles are for the staff to use to travel to remote villages. The room also served as a meeting place. Currently ARHC is raising funds to improve the clinic by replacing the water pipes in the whole hospital and doing some reconstruction work to keep the buildings in good condition. They are also trying to find a work team of volunteers to do this but they have not found the people, yet. Contributions can be sent to Curamericas.